Challenges in the field of hosting and everything connected to it? There are plenty. As hosting experts, we are happy to give you advice. We use our know-how in order to develop optimal solutions together with you. Firstly, we listen to your challenges and objectives. We pose critical, but crucial questions in order to get to the heart of the matter. This allows us to find the solution that perfectly suits your specific situation. You will not only get advice before the project, but also during and after each project. We have built up a strong expertise in quite a number of domains. Ask us for advice for various types of challenges. Hosting is our core business. We offer all types of hosting. With advice on the most suitable solutions for your company. During peak periods, you need additional capacity. In order to avoid downtime, we ensure that your hosting is scaled in a flexible way. We are true advocates of DevOps. The synergy between developers and sysadmins leads to better performance and secure solutions. Your project – from development to staging, testing and production – passes through different environments. But what if they run on different platforms? 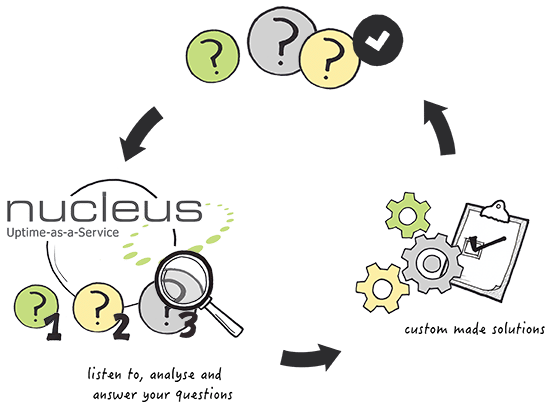 At Nucleus, we offer solutions in order to match them to each other. What does consultancy mean for you?